Potter County Implement in Gettysburg, Walworth County Implement in Selby, Edmunds County Implement in Roscoe, Greenline Implement in Miller, Fred Haar in Freeman, Fred Haar Implement in Yankton, Fred Haar Implement in Wagner, and Davison County Implement in Mitchell. The South Dakota FFA has been a major part of the spirit of South Dakota’s youth and agriculture for more than 90 years. Our daily mission is to make a positive difference in the lives of students by developing their potential for premier leadership, personal growth, and career success through agricultural education. A sponsorship with the SD FFA is a great way for businesses and organizations to “co-brand” their products and services in the SD FFA and agriculture education marketplace. More than a sponsorship, our programs are designed to create a win-win scenario for participants—many sponsors refer to our program as a partnership. In addition to the good name and reputation of the SD FFA, businesses have a partner in recognizing their gift and support to the members SD Team Ag Ed. Our program is designed with varying levels of participation, affording participants the flexibility to choose their level of sponsorship through the SD FFA Foundation — helping us meet the needs of our special projects. A cooperative effort, under the direction of the SD FFA Foundation, will involve our Team Ag Ed members — SDAAE, The SD FFA Alumni Association, the SD FFA Association, SD Future Ag Leaders, SDSU Ag Education, and SD Adult Farm Business Management. Each of these organizations will promote your sponsorship accordingly. Members of each group will be educated about our “partners” and the importance of their sponsorship participation in supporting our special projects. 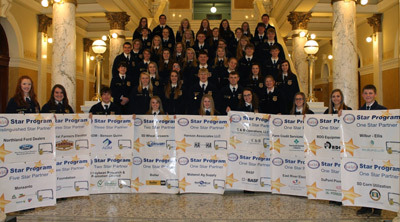 The purpose of the Star Partner Program is to promote those businesses and organizations supporting the longevity of the SD Team Ag Ed program through their sponsorship. The SD Team Ag Ed family will encourage those who use promotional items, supplies, and services to choose a SD FFA Foundation Star Sponsor.